Japan's Prime Minister Shinzo Abe, left, escorts India's Prime Minister Narendra Modi while reviewing an honor guard ahead of a meeting at Abe's official residence in Tokyo Monday, Oct. 29, 2018. New Delhi and Tokyo have officially agreed to begin negotiations of an acquisition and cross-servicing agreement. In a joint statement issued at the end of a bilateral summit meeting in Tokyo between Indian Prime Minister Narendra Modi and his Japanese counterpart, Shinzo Abe, India and Japan agreed to begin formal negotiations over a so-called acquisition and cross-servicing agreement (ACSA), which would allow the Indian military and the Japan Self Defense Force (JSDF) to use each other’s bases for logistical support. “The two leaders welcomed the joint exercise between each of the three services and the commencement of negotiations on the Acquisition and Cross-Servicing Agreement (ACSA), which will enhance the strategic depth of bilateral security and defense cooperation,” the October 29 joint statement reads. Indian and Japanese officials have been exploring the conclusion of an ACSA for the past months. The ACSA would permit the Indian Navy (IN) access to a Japanese base in Djibouti, while the Japan Maritime Self Defense Force (JMSDF) would be permitted to use India’s military installations on the Andaman and Nicobar Islands located in the Indian Ocean, which lie near the Malacca Straits, next to other naval facilities. 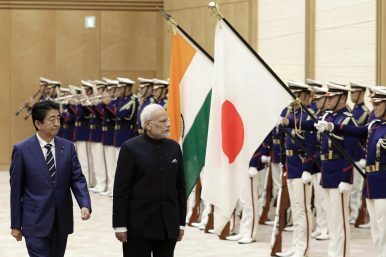 The ACSA was discussed during the annual India-Japan Defense Ministerial Dialogue held in New Delhi this August, with representatives from the two countries agreeing that a swift conclusion of the agreement is in both New Delhi’s and Tokyo’s interest. The ASCA was also on the agenda a meeting of the Indian national security advisor, Ajit Doval, with his Japanese counterpart, Shotaro Yachi, in New Delhi earlier this month. “We hope to start formal negotiations with regard to signing of the ACSA,” Japan’s ambassador to India, Kenji Hiramatsu, was quoted as saying by Reuters ahead of the summit meeting last week. “It is high time we had mutual logistics support.” Both sides are thought to be seeking a rapid conclusion of the ACSA negotiations in order to ease logistics for a number of joint Indo-Japanese military exercises scheduled for 2019 and 2020. Next to the ACSA, India and Japan also pledged closer cooperation at the operational level between the navies of both countries. “Recognizing that enhanced exchanges in expanding maritime domain awareness (MDA) in the Indo-Pacific region contributes to regional peace and stability, they welcomed the signing of the Implementing Arrangement for deeper cooperation between the Indian Navy and the Japan Maritime Self-Defense Force (JMSDF),” the statement reads. Notably, while there has been some progress on fostering closer bilateral military ties, both countries once more failed to conclude an agreement over the purchase of 12 Japanese-made Shinmaywa US-2i amphibious search-and-rescue/maritime surveillance aircraft for the Indian Navy. India and Japan have been discussing a possible aircraft deal for the past five years. The Indian and Japanese prime ministers will discuss a military base sharing agreement during their summit later this month. Abe, Modi Herald 'Unparalleled Potential' in Japan-India RelationsIndia and Japan Boost Relations With High-Tech FocusModi Visits Japan: What’s on the Security Agenda?Japan-India Maritime Exercise 2018: Operational Clarity, Strategic Confusion?Are India and Japan About to Conclude a $1.3 Billion Military Aircraft Deal?